Lethal deficiency of thiamine (vitamin B1) is widespread among wildlife over large geographical areas in the Northern Hemisphere. Now, researchers from ACES with colleagues from the Swedish National Veterinary Institute show that there is a direct link between thiamine deficiency and the population decline in the common eider in Sweden. Their results are published in the journal Scientific Reports. Thiamine deficiency has previously been associated with a range of effects, such as reduced growth, altered organ size, impaired overall nutritional status, blood chemistry, and swimming endurance, as well as increased susceptibility to infections, altered behaviour, and substantial negative effects on reproduction. The first time that thiamine deficiency in birds, such as the common eider, was shown with chemical and biochemical methods was in 2009. In Sweden, however, typical thiamine deficiency symptoms in birds had been observed as early as 1972. “Thiamine deficiency now impairs common eider reproduction to such an extent that stable populations cannot be maintained, as shown by studies of the relationship between thiamine status, brain lesions, abnormal behavior, and reproductive output. The eiders lay fewer eggs than normal, and even when eggs do hatch, fewer ducklings than normal survive, so population declines are inevitable. This is not a temporary phenomenon. Rather, the same low reproductive output has been observed for six consecutive years,” says Torsten Mörner, associate professor at the Swedish National Veterinary Institute and the lead author of the paper. In this study, the researchers confirmed thiamine deficiency using chemical analyses of liver and brain samples from common eider ducklings collected in the Blekinge archipelago, southern Sweden. When the researchers treated eider ducklings with thiamine, they found that it prevented death. They also showed a link between the inability to dive and the presence of a brain lesion typical of thiamine deficiency. 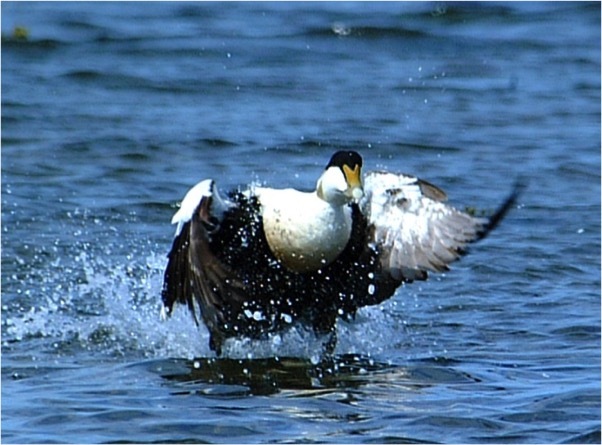 “The relationship between thiamine deficiency and reproductive failure in the common eider demonstrates a strong connection between biochemistry and ecology. What we need to do next is to search for the underlying cause of the thiamine deficiency,” says Lennart Balk, professor at ACES and co-author of the study. So far, studies of thiamine deficiency in wildlife have contributed important knowledge about the distribution of thiamine deficiency in time and space, as well as in various species. Besides birds, well-documented thiamine deficiency occurs also in a number of fish species, and recently, blue mussels were added to the list of affected animals. Such knowledge will hopefully lead to a more integrated picture of the problem and facilitate the prioritization of candidate mechanisms for more detailed evaluation of causality. So how do these findings fit into the big picture of thiamine deficiency among wildlife today? According to the researchers, it cannot be excluded that the thiamine deficiency observed in nature today is so severe that it significantly contributes to the ongoing worldwide extinction of many animal species. They also stress that other researchers have pinpointed this loss of biodiversity as the most serious of all threats to life on earth today.